While many recent theories seeking to explain the widespread aggregation of communities in the late prehistoric Southwest have emphasized economic factors tied to environmental change, there is another way to look at this process. This perspective sees environmental factors as still being important drivers of aggregation, but indirectly, through increased competition for scarce resources leading to an increase in conflict and warfare, which results in aggregation as a defensive measure. Probably the most prominent proponent of this idea is Steven LeBlanc, who has argued that warfare played the main role in driving Pueblo aggregation. LeBlanc’s arguments are based in large part on the (to him) obviously defensive nature of many settlement locations during the period of aggregation, the limited but important direct evidence of violence in the form of destroyed communities during the same period, and the coalescence of the population of the Southwest not only into large, defensible, aggregated communities but also into clusters of such communities with large open areas between them that could have served as buffer zones between enemy groups. LeBlanc makes what I consider a convincing case for the importance of warfare in driving settlement aggregation in the late prehistoric period, and it adds an important element to Charles Adams’s model explaining the adoption of the kachina cult. Specifically, it adds two earlier stages to the model. The new model is outlined below. Environmental deterioration resulting in decreased resource base and increased competition for scarce resources. Increased intercommunity conflict and warfare resulting in some aggregation of formerly dispersed communities into larger and more defensible communities without necessarily involving long-distance migration. Migration of groups away from resource-poor, war-torn areas into more attractive locations. Aggregation of communities in target regions into plaza-oriented villages, either by incorporation of immigrants into existing aggregating communities or by immigrant communities migrating together and establishing defensive settlements in hostile territory. Introduction of the kachina cult to aggregated or aggregating villages, improving integration of formerly distinct groups into united communities. Continued aggregation and incorporation of new immigrants into successful communities with a strong kachina cult. The presence of plaza-oriented or inward-facing community layouts is crucial to this model in two ways. 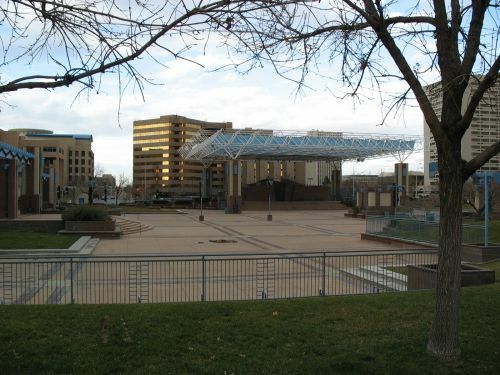 For one thing, the plaza-oriented layout is highly defensible; it generally contains few or no external entrances, with all access to the roomblocks that make up the community being from the plaza. This explains why, in a context of widespread warfare, newly aggregating communities would have chosen this layout. 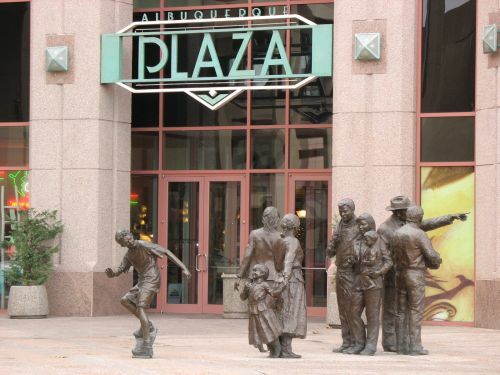 Recall that Adams noted in his model that the adoption of plaza-centered layouts tended to come before the adoption of the kachina cult. Beyond its defensive nature, however, the plaza-oriented layout is important because it facilitated public performance of kachina ritual. As Adams pointed out, one of the most important attributes of the kachina cult is that it is public and accessible to the whole community, in addition to involving secret, esoteric knowledge that would be attractive to community leaders to enhance their authority. 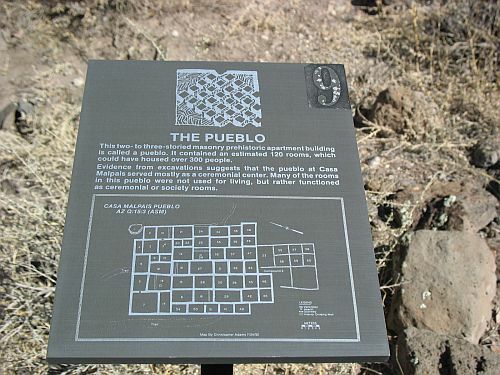 Pueblos that already had open plazas would have an advantage in adopting the cult and taking advantage of its power to integrate diverse communities, while those that consisted of massed roomblocks with no public open spaces would have been at a disadvantage and may have been inspired to add on roomblocks to form an enclosed plaza in which to perform kachina dances. Adams notes that some of the sites at Homol’ovi seem to have started out as single, massed roomblocks and to have added enclosed plaza areas later. Whatever the reason for initial adoption of the plaza-oriented community layout, it necessarily led to significant changes in daily life. With all households in the village facing onto the plaza, everyone could potentially see what everyone else was doing, and the resulting lack of privacy could easily lead to interpersonal conflicts, both between individuals and between households, clans, or other segments of the village that may have been autonomous units not long before and not yet be fully integrated into the new, larger community. The potential tensions were both very real and very dangerous to group cohesion, which may explain why so many of the initial aggregated villages did not last very long. The introduction of a community-wide integrative system such as the kachina cult would have been a substantial advantage in addressing these problems. Thus, increased warfare led to aggregated communities using a variety of layouts at first, and the introduction of the kachina cult, which itself may or may not have had anything to do with warfare or defense, made those communities that adopted it much more successful at integrating diverse immigrants than other communities using other layouts and/or ritual systems. This led other, non-plaza communities either to join kachina-using communities or to add plazas to their own communities and adopt the cult themselves. This new model, while obviously a drastic simplification of what was surely a very complicated process, can be an effective tool to examine the contexts in which the kachina cult was adopted and its usefulness for the communities that adopted it. It may also shed light on the issue of when and where the cult first arose, by considering the chronology of environmental deterioration and increased warfare as another factor to compare with aggregation and the appearance of kachina imagery. 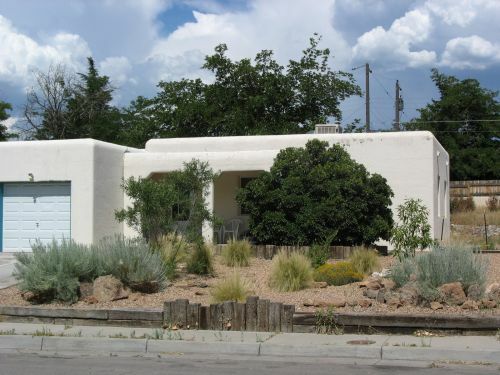 The terrain around the city of Albuquerque is divided topographically into two major regions: the valley and the mesas. 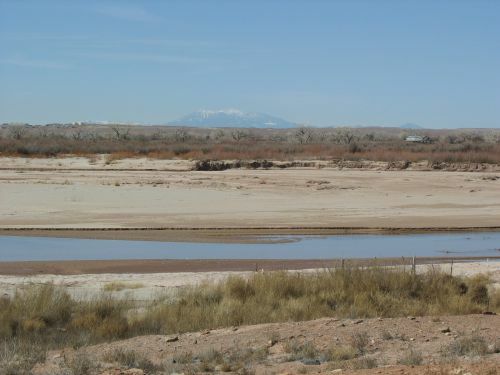 The valley is the thin strip of land on either side of the Rio Grande, while the mesas rise up from it on either side. 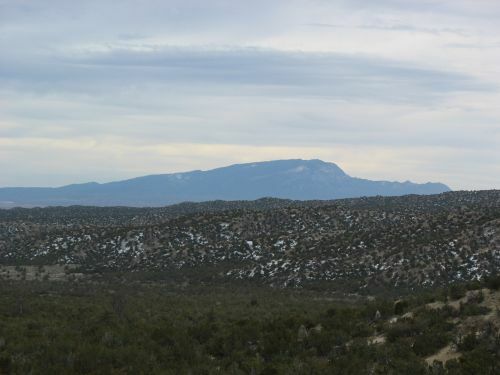 The East Mesa continues to rise gently for several miles until it reaches the foothills of the Sandia Mountains, and the West Mesa rises a smaller amount up to a row of extinct volcanoes. The Sandias on the east and the volcanoes on the west form the rough boundaries of the metropolitan area in those directions. The river runs from north to south, so in those directions there are no significant natural barriers to development. 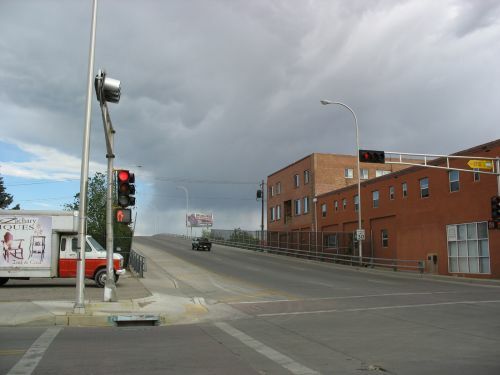 There are barriers to development that form edges of the city, at least for now, but they take the very different, and potentially more malleable, form of Indian reservations: Sandia Pueblo to the north and Isleta Pueblo to the south. 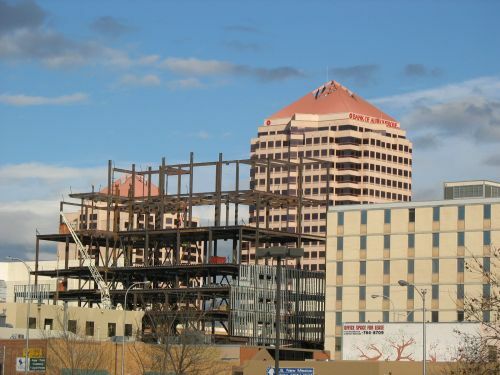 Most of the development in Albuquerque since the coming of the railroad in 1880, and there has been a lot of it, has taken place on the mesas. 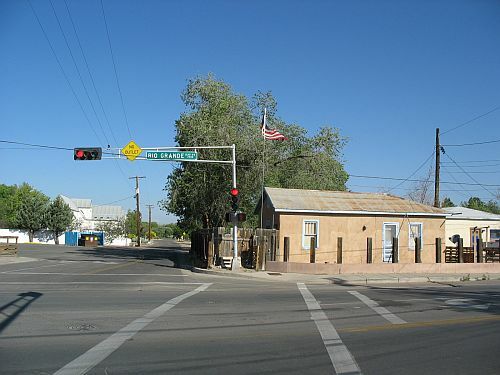 While the grid of streets next to the railroad tracks, known as New Town when it was originally laid out in the late nineteenth century and now known as Downtown, lies in the valley on the east side of the river, and the much older Hispanic settlement known today as Old Town lies to the west of it and even further into the valley, by the early twentieth century it was becoming clear that the mesas were where the action was. 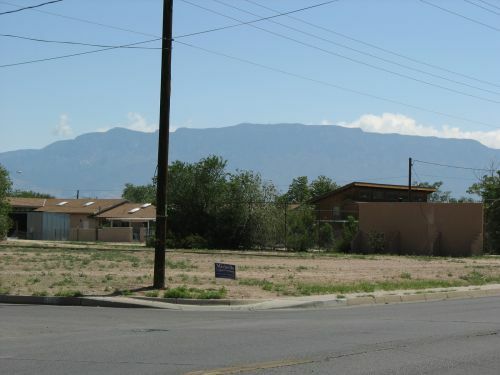 The neighborhood known as Huning Highlands, one of the first additions to the original New Town and one of the most successful, starts at the eastern edge of the tracks and extends up to the western edge of the East Mesa. Land speculators platted additions in the empty space between Old Town and New Town along Central Avenue, but they filled slowly while other additions heading east from Huning Highlands thrived. 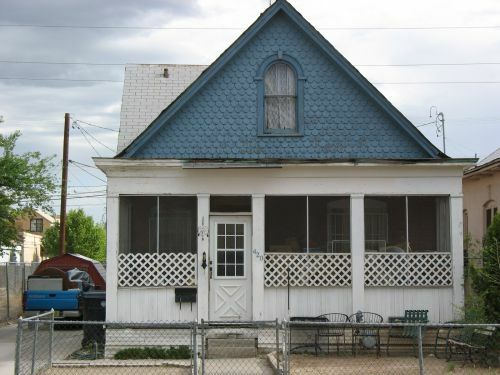 There are a variety of factors that likely contributed to the growth of the mesas and the stagnation of the area around Old Town. 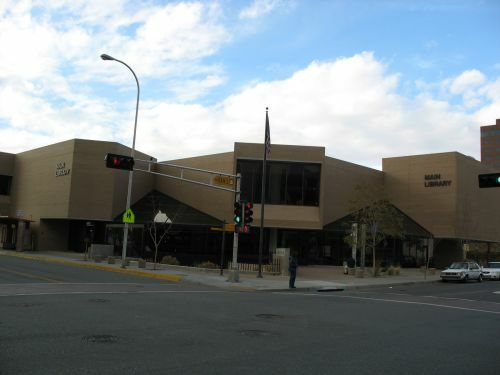 One was the decision, made by the New Mexico territorial legislature in 1889, to put the campus of the University of New Mexico on the East Mesa. 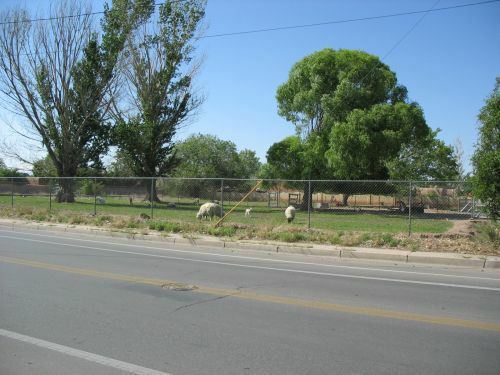 The site chosen was at the time quite some distance from the developed parts of Albuquerque, but once classes began development started to follow. Central Avenue extended east from Huning Highlands to form the southern boundary of the campus, and subdivisions began to spring up all along it. A streetcar line followed, easily linking the new developments to the commercial Downtown. The streetcar system, originally intended to link New Town to Old Town and to draw the two together into a single city, ultimately had the opposite effect: it connected the mesa developments to Downtown, but was unable to establish any strong linkages further west. 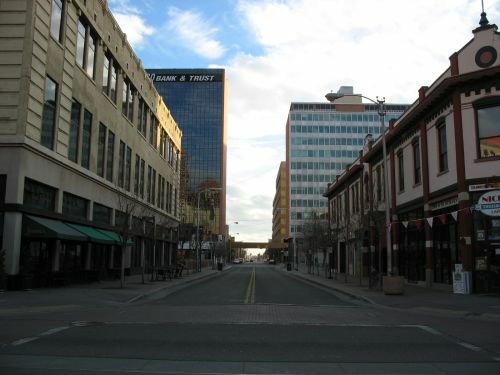 As a result, the mesa boomed while Old Town stagnated. 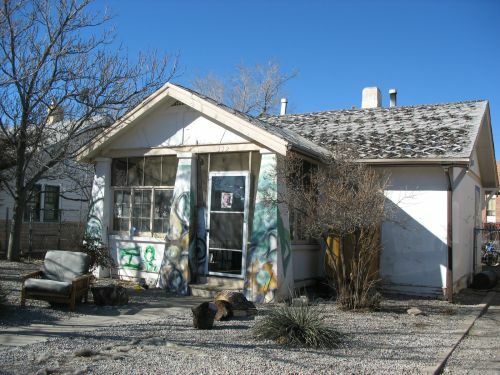 With car-oriented development accompanying the massive investment in the area by the government during World War II, sprawl continued to rapidly expand over the East Mesa, and similar developments began to occur on the West Mesa as well. 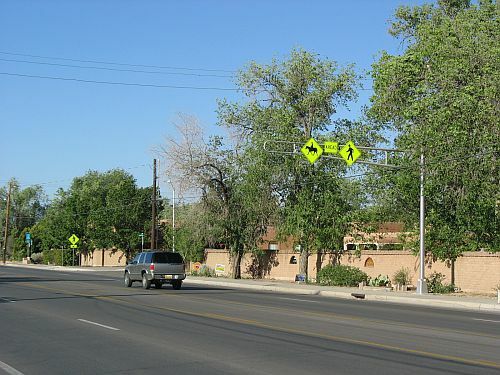 By the 1980s, the east side of town was almost entirely built-out, and development had shifted mainly to the west side, including the new suburb of Rio Rancho to the north. The valley, however, experienced a very different trajectory of growth over this same period. 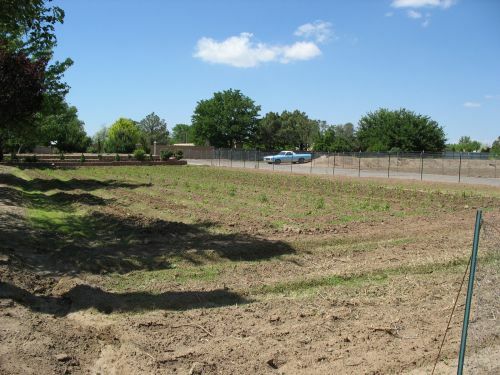 While the mesas had consisted almost entirely of empty rangeland before being subdivided and developed, the valley was home to a string of small Hispanic farming villages. Most of these had been founded in the nineteenth century, although a few were much older. 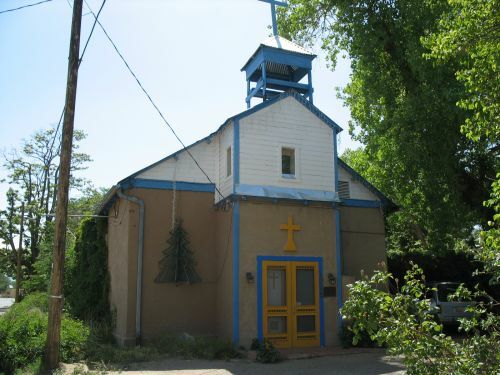 Atrisco, on the west side of the Rio Grande, actually predated the founding of Old Town Albuquerque on the east side directly across from it in 1706. Most of these villages grew up around the large landholdings of individual wealthy families, from which they tended to take their names. 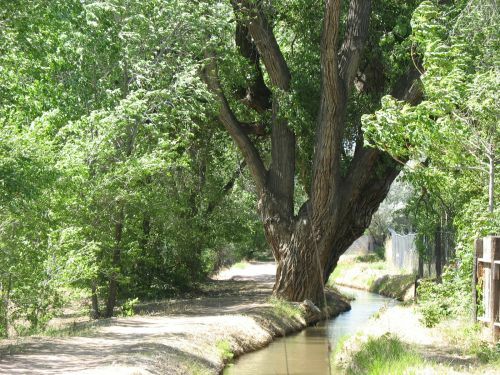 Thus, the string of villages along the river, extending both north and south of what is now the Albuquerque metropolitan area, included such places as Los Griegos, Los Candelarias, Los Duranes, Los Barelas, and Los Lunas. 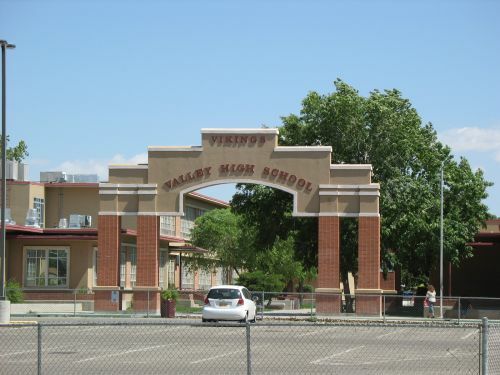 Not all of the villages were named after families, however, and some had names like Algodones, Los Corrales, Los Ranchos de Albuquerque, Pajarito, and Valencia. 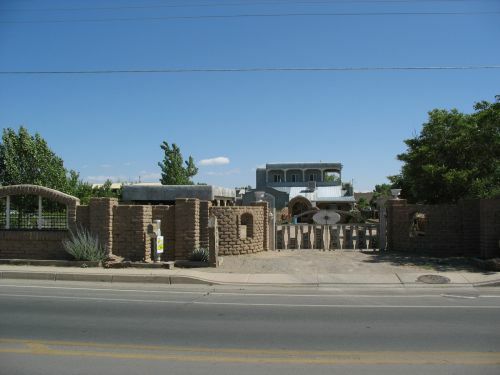 These villages were predominantly agricultural and Hispanic long after the city of Albuquerque began to sprawl onto the mesas with subdivisions composed of suburban-style ranch houses filled with predominantly Anglo white-collar workers. Over time, however, development began to reach the valley as well, and here it took a very different form. 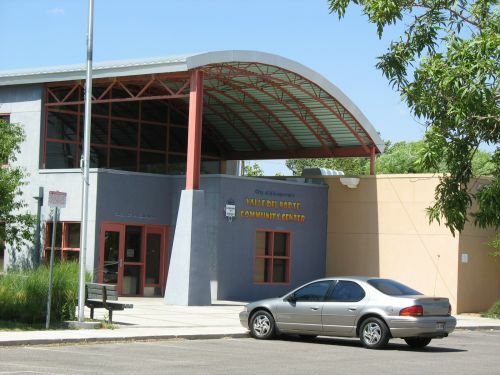 Instead of the suburban developments modeled after similar neighborhoods being built throughout the country in the postwar era, developments in the valley were based more on local Hispanic architectural and site-planning principles. 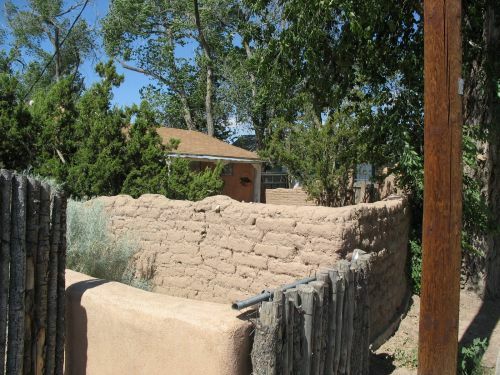 The houses were often made of adobe, or at least designed to look like they did. Gated communities reminiscent of the old family compounds of the wealthy families after whom the villages were named became much more common than on the mesas, where open subdivisions of tract houses predominated. 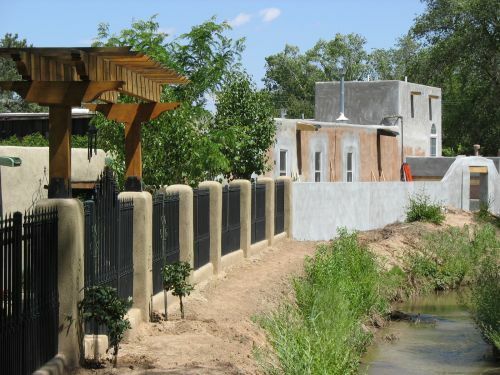 The very wealthy built huge houses close to the river and the strip of cottonwood forest next to it known as the Bosque. The more middle class began to build on the farmland between the old villages. The city, having already grown accustomed to using its annexation powers to include the mesa developments, began to annex more and more of the valley development too. 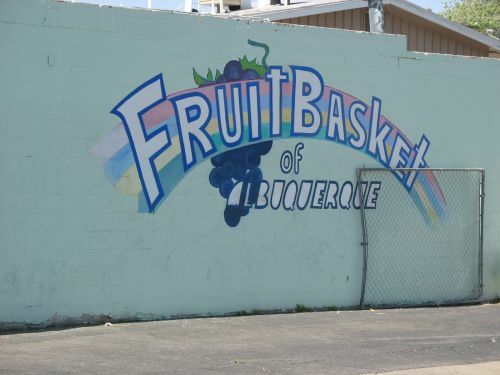 Some of the old villages, however, managed to incorporate on their own and avoid being swallowed up by the behemoth that Albuquerque was becoming. As these processes continued, the valley began to finally become part of the overall city, and the decline of Old Town began to reverse. Today Old Town is a charming and largely tourist-oriented area with cute shops and several museums, while the residential areas to the north of it have largely become quiet neighborhoods that still retain much of their rural character. 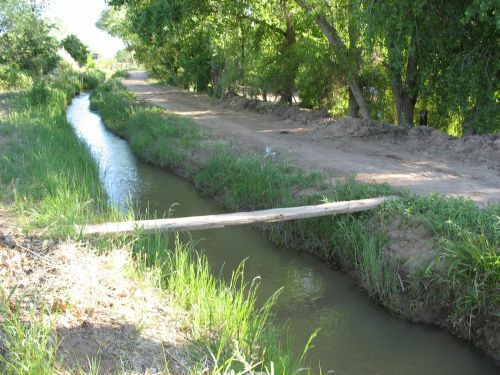 There are still a few agricultural fields sprinkled among the gated communities and odd little businesses, and the old network of irrigation ditches known as acequias stills winds through the area. This increasing development, however, also had the effect of splitting the valley into two very different parts. 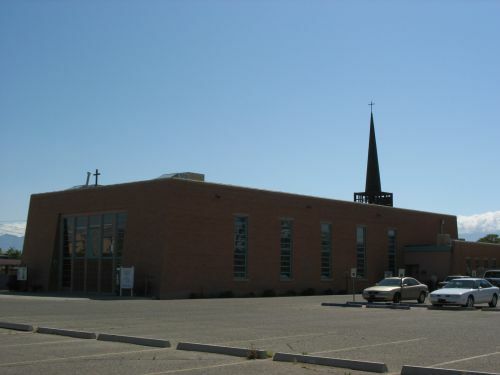 Development and annexation was largely confined to the area north of Old Town, which became known as the North Valley. 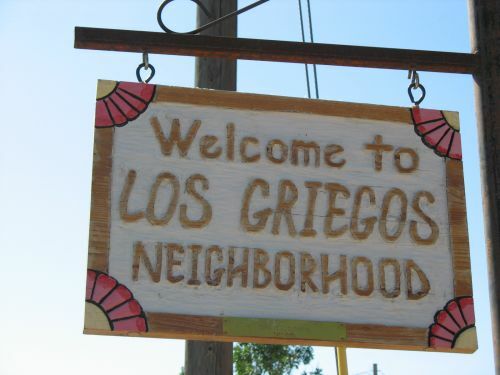 The old villages in this area either incorporated and established independent identities (Corrales, Los Ranchos) or were swallowed up entirely by the city and lost whatever identity they had once had (Los Candelarias, Los Griegos). South of Old Town, however, this didn’t happen. 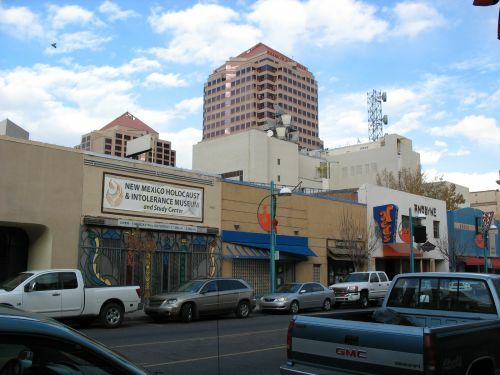 This area, known as the South Valley, saw little development and remained mainly rural, agricultural, Hispanic, poor, and outside the Albuquerque city limits. 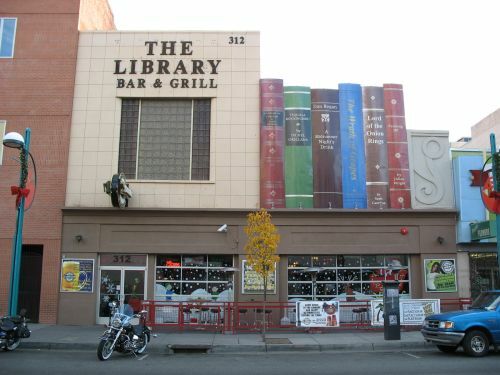 It remains so to this day, and has a rather bad reputation as a high-crime, low-income area. The old villages have seen a bit of new commercial development, and a few housing developments, but nothing like what has happened further north, and most remain individual communities separated by farmland. 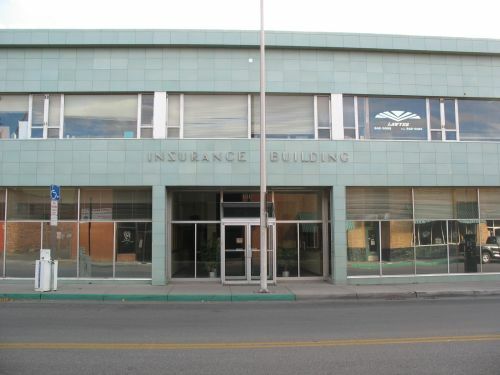 It’s not clear why the North Valley saw so much investment and so many changes while the South Valley, which started out more or less the same, was allowed to stagnate. One possible answer has to do with topography. 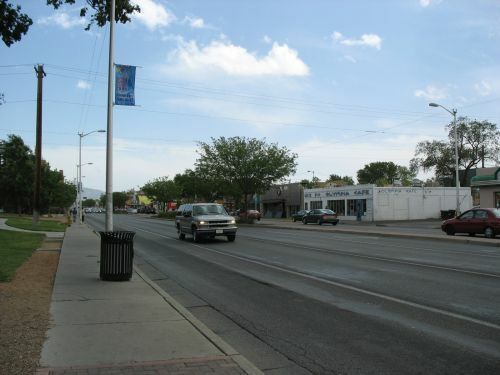 It just so happens that the North Valley is mostly on the east side of the river, directly adjacent to Old Town and convenient to Downtown, while the South Valley is mostly on the west side, which has seen a lot of recent residential and commercial development but has always been relatively peripheral to the major activities of the city. All the main government functions are concentrated on the east side, as are the major banks and other high-level commercial functions. This topographical oddity occurs because the river happens to run directly along the bluffs forming the eastern edge of the West Mesa for most of the North Valley, then curves to the east (forming the curve in which Old Town lies) to run approximately halfway between the two mesas through the South Valley. Because of the shape of the mesas themselves and the way it interacts with the river channel, there ends up being more land available on the west bank for this stretch. 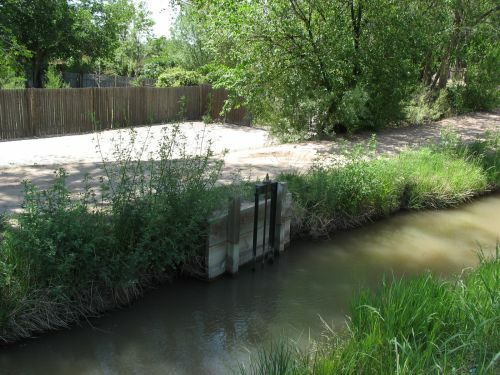 Thus, the South Valley villages were considerably more isolated, especially in the early days when the river could only be crossed by ferry or unreliable pontoon bridge, which may have made it less of an option for developers looking to make a quick buck off of rich people’s desire to combine the charm of old New Mexico country life with the convenience of proximity to the big city. Some of the most important work on the origins of the kachina cult is that done by E. Charles Adams of the Arizona State Museum, particularly his 1991 book focusing specifically on the subject. In this book he summarizes the available evidence for the origin and early development of the kachina cult, and based on the distribution of the archaeological manifestations of the cult that he identifies he concludes that it originated in the Upper Little Colorado River area of east-central Arizona in the period between AD 1275 and 1325. Adams’s reasoning for this conclusion is based on his comparison of the distribution of four types of evidence that he presents as reflecting the presence of the cult: rock art, pottery, plaza-oriented village layout, and rectangular kivas. His summaries of the distribution of all these features in space and time are very useful, but his conclusions about the origins of the kachina cult go well beyond the evidence he presents and are not very convincing. His method for determining the origin of the cult is to look at the distribution of the four features he identifies and find where they first overlap. This seems reasonable enough. Unfortunately, there does not turn out to be any place where the features all overlap sufficiently early to be associated with the initial development of the cult, so Adams has to resort to finding a place where three of the elements overlap. The three elements he uses are pottery style, plaza-facing village layout, and rectangular kivas, which he finds present together earliest in the Upper Little Colorado River area in the late thirteenth and early fourteenth century. He therefore concludes that this is when and where the cult originated and proceeds to describe its rapid spread to the north and east over the course of the fourteenth century. Unlike many other researchers, including Polly Schaafsma, he considers the cult to be fundamentally indigenous rather than Mesoamerican in origin, although he concedes that some elements of it were probably subject to influence from groups to the south such as the Hohokam and Salado. 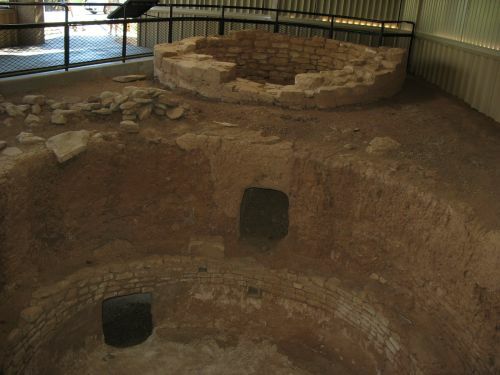 Adams theorizes that after its initial spread the cult was greatly elaborated at Hopi, where it acquired its strong association with rainmaking and began to be reflected in elaborate kiva murals, and that it subsequently spread in modified form from Hopi to areas that had already adopted the initial cult directly from the Upper Little Colorado, such as Zuni and the Albuquerque area of the Rio Grande valley. 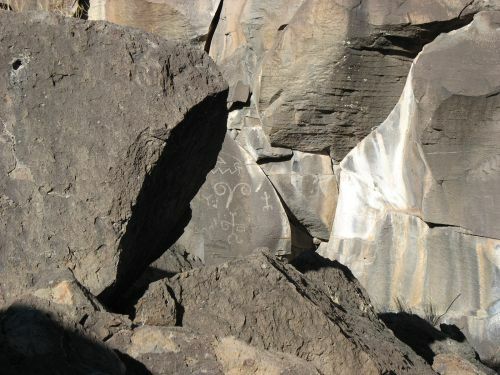 It is only at that point, after AD 1400, that Adams sees any influence from the Jornada Mogollon coming up the Rio Grande, and he sees this influence, reflected in the Jornada rock art style and a similar style in some kiva murals, as secondary to the Upper Little Colorado and Hopi kachina cult influence already present in the Rio Grande valley. He even speculates that the Jornada influence may not have affected the kachina cult itself at all, and that it may have had more to do with other societies present among the Eastern Pueblos having more to do with war. This theory is problematic for a number of reasons. For one thing, Adams relies very heavily on the distribution of pottery styles as evidence for the spread of the kachina cult, but he never establishes the association between the cult and the styles he mentions. He focuses on the so-called “Fourmile style” (named after Fourmile Ruin in the Upper Little Colorado area), a style of polychrome decoration that affected pottery types throughout the Southwest in the fourteenth century. Among the features of Fourmile style that Adams emphasizes are its use of asymmetrical decoration on the interiors of bowls, its extensive use of bird and feather imagery, and its occasional use of obvious kachina cult symbolism, particularly masks or whole anthropomorphic masked figures. It is the last aspect of the style that is clearly most associated with the kachina cult, and the presence of this sort of imagery on ceramics is certainly as clear a sign of the presence of the cult in a given area as the presence of similar motifs in rock art, but Adams goes beyond this observation to associate any use of the Fourmile style with the spread of the cult. This is not something that can just be assumed, however. It is important to note that the Fourmile style was very widespread, including in areas without any other evidence of kachina cult imagery, and it is quite possible that the distribution of the style is completely independent of the distribution of the cult. That is, the Fourmile style may just have been the style of decoration that was popular at the time that the kachina cult happened to be spreading throughout the northern Southwest, so that groups that adopted the cult may have used its imagery on their Fourmile-style ceramics without there being any particular association between the style in general and the cult. Thus, while Fourmile ceramics with kachina imagery would clearly be evidence of the distribution and spread of the cult, Fourmile ceramics without it would not necessarily be, and Adams’s extensive use of them undermines his conclusions significantly. Another major problem with Adams’s approach is the way he largely disregards the rock art evidence. When he realizes that there is no place where all four of his lines of evidence come together at the proper time, it is the rock art evidence that he ignores. This is why he is able to conclude that the cult originated in the Upper Little Colorado area, where rock art evidence for the presence of the cult is very slim (probably due largely to the limited study of rock art in this area). Rock art, however, is the most straightforward and obvious evidence there is for the presence of the cult. Unlike Fourmile style ceramics, Rio Grande style rock art is full of kachina imagery, and it is very different from earlier rock art styles in the area where it appears. Schaafsma’s theory linking the cult to the Jornada Mogollon depended largely on the rock art evidence. Recall that her argument for transmission of the cult up the Rio Grande via the Jornada depended largely on the lack of rock art evidence for the presence of the cult in the Mogollon Rim and Upper Little Colorado area. 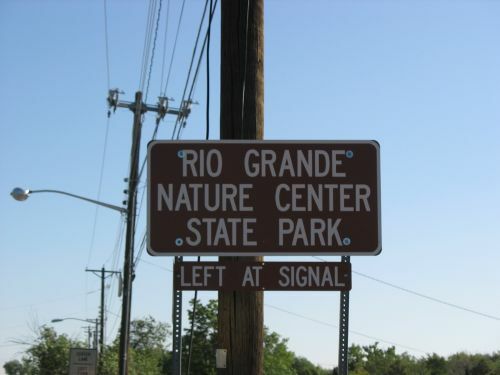 Adams, although he argues for the transmission (and, indeed, the origin) of the cult in this area merely assumes that the Rio Grande style originated in the Upper Little Colorado area along with the cult and that it is unrelated to the Jornada style, which he sees as a late introduction to the Eastern Pueblos after the Rio Grande style was firmly established. It is not hard to see why Adams puts so much emphasis on pottery and so little on rock art. He is trying to determine the time as well as the place of origin of the kachina cult, and to do that he needs evidence that can be securely dated. In the Southwest pottery styles are very well dated by association with tree-ring-dated contexts where they appear, and they therefore give quite precise dates even for sites that have note been excavated or dated in any other way. Rock art, on the other hand, is notoriously difficult to date. Pictographs, which are painted onto the rock surface often using some sort of organic paint, can sometimes be carbon-dated by samples of the paint or other associated organic artifacts, but this technique has rarely been used in the Southwest, and the much more common petroglyphs, which are pecked or incised into the rock surface, cannot be directly dated at all and can only be assigned very general dates based on their style and/or proximity to dated sites. Thus, associating the spread of the kachina cult with the spread of the Fourmile style, which does seem to have occurred around the same time, gives Adams much more chronological control than Schaafsma has with her rock art styles, and it even allows him to argue, in direct opposition to Schaafsma’s interpretation, that the Jornada style in the Rio Grande valley is later than the Rio Grande style rather than ancestral to it. 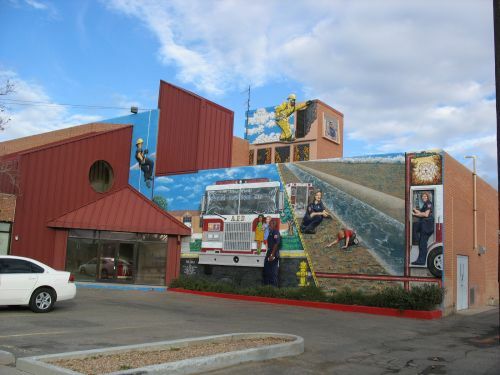 His justification for doing so is very shaky, being based on similarities between the Jornada style and the style of kiva mural found at sites such as Kuaua, north of Albuquerque, but it is not possible to prove that he is wrong. Nor, for that matter, is it possible to prove that he is wrong to associate the Fourmile ceramic style with the cult, although he does so on similarly shaky grounds. Immigration: Starting around AD 1275, when major environmental changes occurred throughout the Southwest, locations that either maintained their attractiveness for settlement or became newly attractive as a result of the changes saw massive influxes of population from the many areas being abandoned at this time. Aggregation: In the locations seeing large-scale immigration, the new immigrants coalesced into large, aggregated villages, either joining previously existing populations or, in sparsely populated or previously unattractive locations, developing their own aggregated villages. These villages are often but not always plaza-oriented. Appearance of kachina cult imagery: Shortly after initial aggregation, the plaza-oriented villages begin to show signs of kachina cult imagery, either in nearby rock art or on locally produced pottery. This demonstrates the adoption of the cult by the village, perhaps in part to deal with the problems caused by rapid aggregation. Continued aggregation: As a result of the usefulness of the kachina cult in integrating the new communities, new immigrants continue to join them and are able to be successfully integrated. This part is important; previous attempts at forming large, aggregated communities in the Southwest had not lasted for long, probably because existing religious and social systems were not able to successfully integrate populations on that scale. 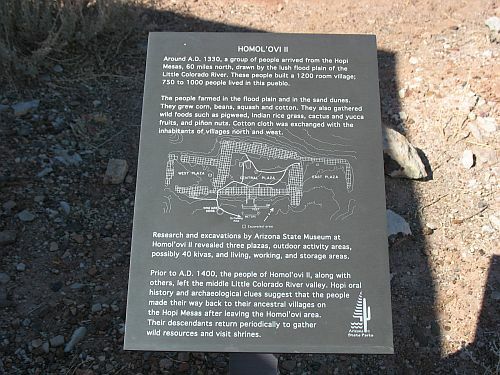 Adams applies this model to the cluster of sites at Homol’ovi Ruins State Park near Winslow, Arizona, where he has conducted extensive research as part of a long-term project by the Arizona State Museum. He finds that the model fits the history of the sites there quite well. Adams’s model can also be used to evaluate the impact of the kachina cult and the development of plaza-oriented village layouts on aggregation in other parts of the Southwest during this time period, and perhaps during others. Adams sets the beginning for his model at AD 1275 to correspond to the environmental changes in the northern Southwest associated with the so-called “Great Drought” of AD 1276 to 1299, and this does correspond to the onset of major aggregation in many areas, but in other areas aggregation began either earlier or later than this, and the adoption (or, perhaps, development) of the kachina cult may have played a role in these contexts as well. Adams’s model may be an effective way to address the relationship between aggregation and the spread of the kachina cult, but it still leaves open the question of why people were aggregating in the first place. 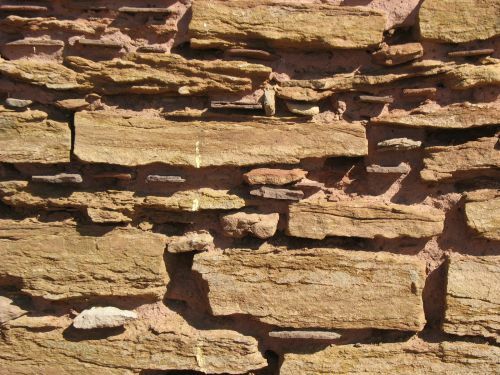 This has been a matter of much dispute and argument over nearly the whole history of southwestern archaeology, and many theories have been proposed. Many of the recent theories revolve around changing environmental conditions and the need for changes in subsistence systems, and they address this idea from varying perspectives, often focusing on the need for more centralized decision-making and/or more efficient land use as the result of less reliable or more difficult conditions for agriculture. In his discussion of this issue, particularly in relation to the case study of Homol’ovi, Adams seems to endorse some version of this idea, with a particular focus on the decisions of community leaders. 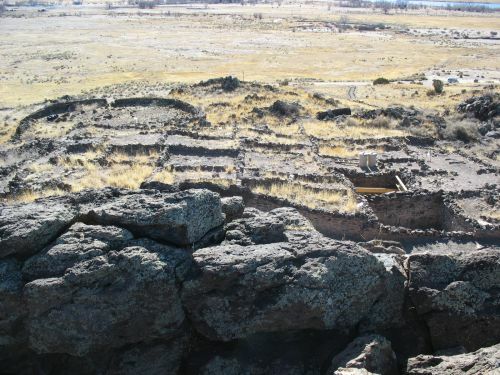 Unlike many archaeologists who study the ancient Southwest, Adams does not present prehistoric Pueblo society as egalitarian, and he assumes throughout his discussion the presence of a two-tiered society with a small priestly class making decisions at a community level and deriving their authority from their control of ritual knowledge. Importantly, however, he notes that this elite never managed to amass the sort of surplus wealth necessary to transform Pueblo society into a truly stratified society with significant economic inequality. 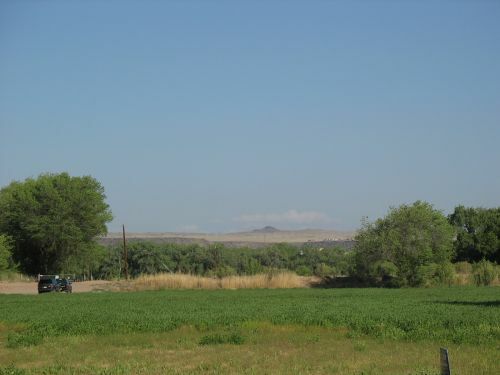 Adams attributes this mainly to the marginal nature of the Southwest for agriculture, but it is likely that another major factor is the communal ideology of the Pueblos, which strongly discourages individual gain and encourages leaders to put the needs of the community above their own desires. The idea that the kachina cult was not an indigenous development among the Pueblos but was instead introduced from the south seems to have originated with a 1974 article by Polly and Curtis Schaafsma. As they note, while some previous scholars had noted some elements of the cult that suggested Mesoamerican influence, the general consensus had been that it developed in the western Pueblo area, probably among the Zunis, and spread at some point in prehistory to the Rio Grande Pueblos further east, perhaps through a migration of Keres speakers. This model was based largely on ethnographic evidence, particularly the way the cult is highly elaborated among the Hopis, Zunis, and Keres (as well as at Towa-speaking Jemez) but much more rudimentary among the Tewas and apparently absent entirely among the Tiwas. Archaeologists hadn’t paid much attention to it, probably because of its abstract nature and the difficulty of identifying specific material correlates of religious cults. Another likely reason for archaeological neglect could be that so much attention throughout the history of Southwestern archaeology has been focused on the Four Corners region, which shows no evidence of adoption of the kachina cult before its total abandonment around AD 1300. This all changed with Polly Schaafsma’s pioneering studies of rock art throughout New Mexico. 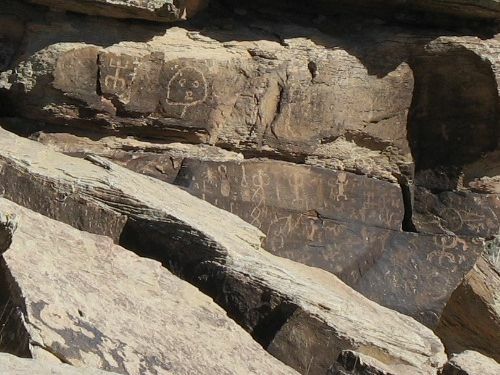 This is the main concern of the paper, which shows quite convincingly that the “Rio Grande style” of rock art that spread throughout the Pueblo area in late prehistoric times contains many elements that seem to clearly reference the kachina cult, particularly the masks that are worn by kachina impersonators. This is in stark contrast to the earlier rock art tradition centered on the Colorado Plateau, which since Basketmaker times had maintained a fairly stable mix of abstract forms such as spirals, simple anthropomorphs, and images of certain animals, especially quadrupeds and lizards. This is the style of rock art found at Chaco, and it’s quite widespread at pre-1300 sites throughout the northern Southwest. 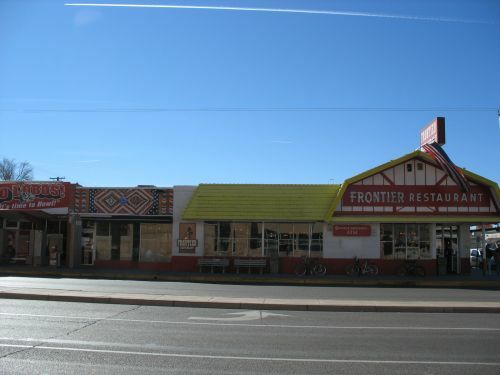 Another style that bears much more resemblance to the Rio Grande Style, though in use at the same time as the Colorado Plateau style, is what the Schaafsmas call the Jornada style. 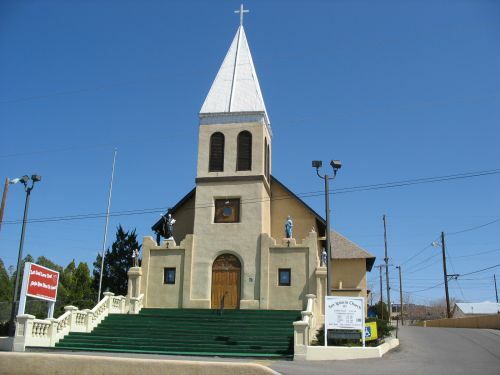 This is named after the Jornada Mogollon who inhabited what is now south-central New Mexico, but the style actually spreads over a larger area of southern New Mexico and West Texas. It appears around AD 1000 in the Mimbres region of southwestern New Mexico, at a time when that region began to develop its distinctive culture, best known for figurative black-on-white pottery with designs that sometimes echo the rock art motifs. By AD 1150 the style had spread east to the Jornada proper, where it developed a high level of elaboration seen especially in painted mask designs at places like Hueco Tanks near El Paso, as well as in petroglyphs at sites like Three Rivers. The imagery in this style is strikingly similar to what would be seen in the Rio Grande style beginning around the time the Jornada people seem to disappear in the fourteenth century, which the Schaafsmas interpret as evidence for the kachina cult and its symbolism developing in the Jornada area and then spreading north up the Rio Grande. 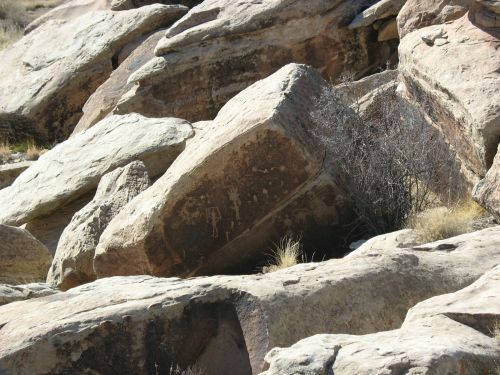 They point to some similarities between the Jornada style and some of the rock art in the Tompiro area just to the north as evidence for the early stages in this process. That’s all well and good, and fairly convincing, although the broad application of the term “Jornada style” could be a bit problematic. They define it to include the Mimbres as well as the Jornada proper, which suggests that the route of transmission of the style and the cult could have been to the northwest from the Mimbres to the western Pueblos rather than to the north from the Jornada to the eastern Pueblos. It’s clear from their discussion, however, that they see the eastern origin and transmission as more likely, and they point to a relative lack of attestation of the style in the mountainous region between the Mimbres and the western Pueblos as evidence against that route. This isn’t all that convincing, though, and my understanding is that more recently some people have indeed argued for a Mimbres origin and/or western route of transmission. All of this leaves out an important issue, though: What about the ethnographic evidence pointing to the western Pueblos as having developed the cult? If the cult came up the Rio Grande from the Jornada Mogollon, why don’t the modern Southern Tiwa Pueblos of Isleta and Sandia seem to have it at all, and why is it so much more developed among the Hopis and Zunis, further from the alleged source, than among the closer Tewas? The Schaafsmas have a response to this concern that I think is pretty convincing. 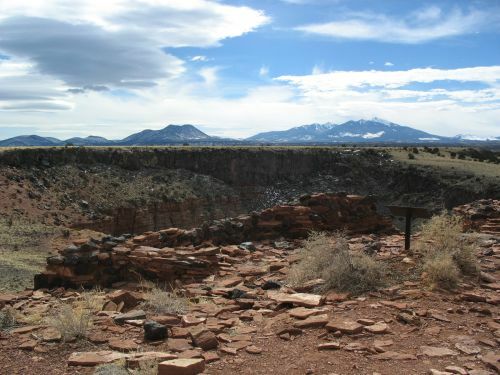 It’s important to keep in mind that the ethnographic Pueblos are the result of hundreds of years of close and often hostile relations with the Spanish and other groups, and especially early in the colonial period the Spanish missionaries were particularly aggressive in trying to stamp out the kachina cult. This effort was not ultimately successful as a general matter, but among some groups, especially the Southern Tiwa, it may have succeeded in extinguishing the cult entirely. Elsewhere, as among the Tewa, it may only have succeeded in encouraging the Pueblos to cut back on outward display of the kachina rites. 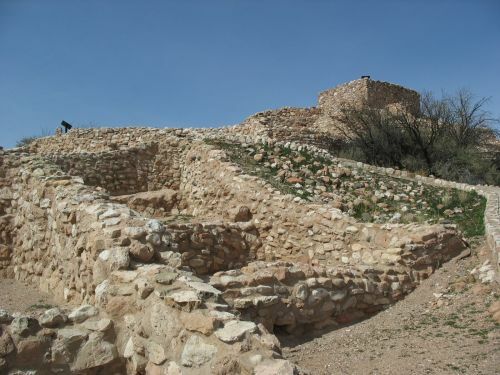 Among the western Pueblos, less troubled by the Spanish, the cult was able to flourish and likely to change in various ways, and many of these changes may have filtered back to the eastern Pueblos once Spanish pressure declined, creating the illusion of the whole cult being introduced from the west. The final issue the Schaafsmas address, and it’s an important one, is why the Pueblos adopted the cult. They note earlier explanations for the adoption of the kachina cult and other social integrative systems that cross-cut kinship connections tying them to the process of aggregation into ever-larger communities starting around 1200. The creation of these large communities out of previously autonomous groups, probably organized along kinship lines, resulted in social stresses that could be smoothed over by the adoption of organizational systems not related to kinship. The kachina cult, which is not at all connected to kinship, would have been a useful solution to this problem. Earlier proposals along these lines had posited an indigenous development of the cult as a response to the pressures of aggregation, but the Schaafsmas propose instead that it was introduced from the south around the same time that the process of aggregation was really taking off (the early fourteenth century), and that its popularity was due to the recognition that it offered a solution to the organizational problems communities were facing. It therefore spread throughout the region very quickly. There’s much more to say about this proposal, of course, and I’ll get more into it later. This initial paper, though, makes a good case for it, and my impression is that while the details are disputed, there’s a general consensus that the overall model is more or less correct. One potential issue is that this particular paper rests entirely on rock art evidence, without considering other possible correlates of the cult such as pottery style and architecture. But that’s a matter for later. This is the proposal I submitted for a term paper I am writing for a seminar on land use. While much more obviously relevant to what I talk about on this blog than the other paper I mentioned, it’s a bit far afield for the subject matter of the course. The professor liked it, though, and he suggested I try to link it to the “collapse” literature (Jared Diamond, etc.) 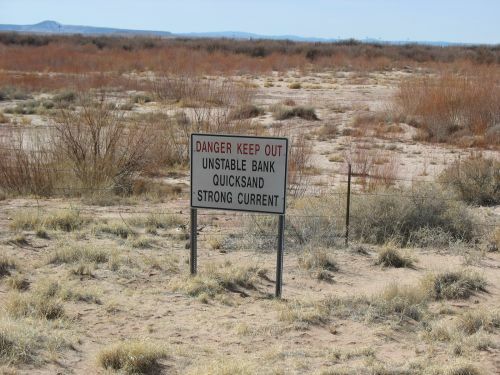 as an example of a sort of “post-collapse” series of events and processes. I like that idea, and I’m going to try to see how to tie the specific evidence I’ll be looking at into that broader context. It should be an interesting project, and I’m pretty excited about it. In the late prehistoric period, ca. 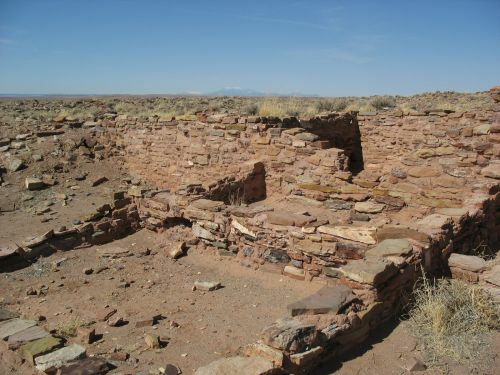 AD 1200 to 1540, the indigenous societies of the American Southwest underwent a series of drastic changes that ultimately transformed them into the Pueblo societies encountered by the first Spanish entradas in the sixteenth century. While the existence of these changes is well-established, the causes and mechanisms involved remain obscure, and heated debates within Southwestern archaeology over these matters have been going on for decades. While the general outline of events is a matter of near consensus, the specific details are by no means settled. Among the most important of the changes in the late prehistoric period was the aggregation of the regional population into a small number of large, compact, and extremely dense nucleated settlements typically consisting of one or two massive roomblocks containing up to a thousand rooms, replacing the previous community pattern of loosely clustered but detached dwellings of a few rooms each associated with community-level integrative public architecture. This transition occurred in all parts of the Southwest, though at different times and rates in different areas, and by AD 1350 virtually the entire regional population was living in aggregated villages. 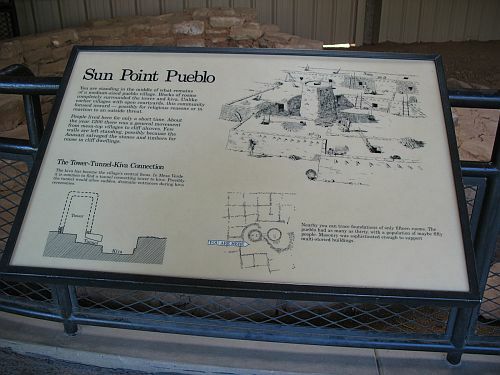 These villages took various forms, but one of the most common was the so-called “plaza pueblo” with connected roomblocks facing on and enclosing one or more internal plazas (these are also sometimes called “inward-facing pueblos”). 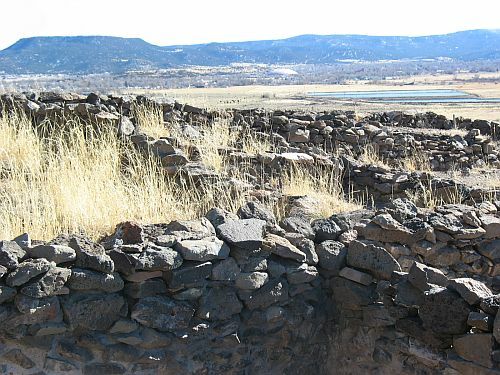 This type of settlement has been proposed by some researchers as associated with another major change sweeping the Southwest at this time: the rise of the kachina cult. The kachina cult is a religious tradition involving a variety of deities called kachinas that are worshipped through ritual dances in which masked dancers impersonate the various kachinas. 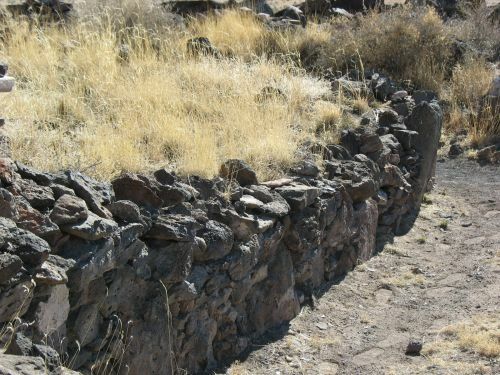 It is best known today in its manifestation among the Hopi villages in Arizona, which have historically been more open to outside observation than the New Mexico pueblos, but it is thought to have been present in all the pueblos at the time of Spanish contact, and most of the modern pueblos, both eastern and western, still retain it in some form (although a few have apparently abandoned it under Spanish missionary pressure). Many of the kachina dances at Hopi take place in the public plazas of the pueblos and in square subterranean ritual chambers known as “kivas,” and some researchers have proposed that the widespread adoption of the plaza-centered pueblo form with square kivas accompanied the spread of the kachina religion, which is generally thought to have originated somewhere in the southern Southwest under the influence of Mesoamerican religious ideas. Unlike some other forms of social organization found in the modern pueblos, such as matrilineal clans, the societies that organize kachina rituals are not kin-based, and they potentially offered a useful way to easily integrate an influx of people from previously separate communities into rapidly aggregating nucleated villages. Thus, the theory goes, during a period of confusion and change in Southwestern society the kachina religion offered an attractive means of organizing the new communities that were being hastily thrown together under new social conditions (possibly including deteriorating environmental conditions and increased warfare). 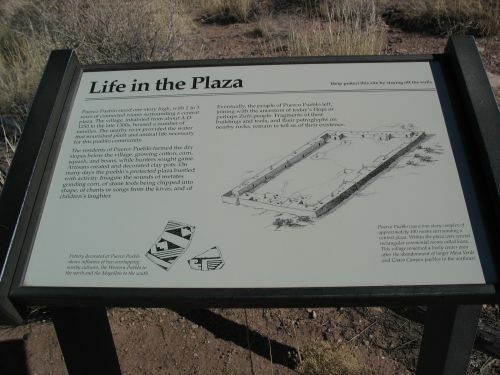 The benefits of the kachina societies were such that most or all communities ended up giving them a prominent or even predominant place in community organization, and in many cases orienting the physical layout of the new communities around the needs of the kachina rituals, resulting in the widespread (though not universal) use of the plaza-oriented or inward-facing layout. In this paper, I propose to test these theories by examining the spatial layouts of communities in the Southwest before, during, and after the spread of the kachina religion. Using data on both excavated and unexcavated aggregated villages, I will compare the presence or absence of plaza-oriented layouts and square kivas to various other attributes, including date, location, and other evidence of kachina symbolism. If the theory of plaza-oriented layouts with square kivas being associated with kachina ritual is accurate, this type of layout should correlate strongly with the spread of other types of evidence associated with the cult, such as rock art, beginning in the southern Southwest and spreading north over time. If this correlation does not hold, however, the importance of the kachina religion to other major changes in the region may be less significant than is often claimed, and other factors may have been more important in determining community layouts. I will examine alternative explanations and compare their explanatory power to that of the kachina theory given the evidence available.